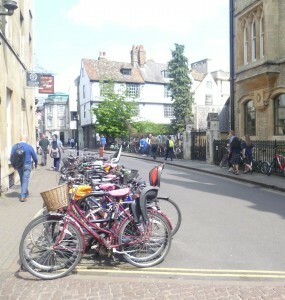 On Friday, my friend Eleanor and I went to Cambridge for the day. We try to do this every year and it’s always a pleasure. It’s a brilliant city for a day out: it’s not too large, there’s plenty to see and do, good places to eat in and a street market with interesting stalls. If the weather’s good, what more can one ask? We caught the fast train from King’s Cross station and forty-five minutes later we were in Cambridge. 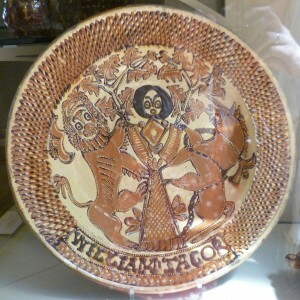 We headed down Trumpington Road to the Fitzwilliam Museum: not, dear Reader, for Culture (at least not initially) but because the lure of coffee was overwhelming. 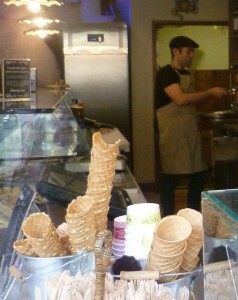 And the Museum has an excellent café. Eleanor wanted to see a small exhibition of landscape drawings from the Netherlands: Brueghel and his Time showing people going about their everyday lives: children playing on the ice; a village street with a tumbledown castle; a boy guiding some pigs down a village lane – one pig rubbing its bottom against a stone. That artist obviously knew pigs, I thought. I loved it. 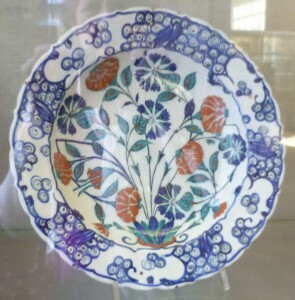 Then, serendipity took over and we found ourselves in a long gallery with an eclectic mixture of pottery, ranging from the very modern, via beautiful 16th century Iznik pottery from Iran (above), to more homely 17th century English pottery, like the commemorative King Charles II plate below. 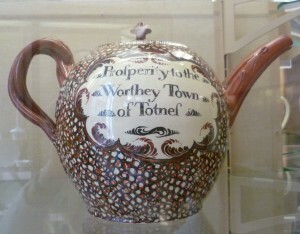 We also liked the teapot which proclaimed, with long 17th century s’s: Profsperity to the Worthey Town of Totnef. What had Totnes done to earn this encomium, we wondered. Eventually, lunch called (culture makes you hungry) so we headed for Market Square. It was exam time for the undergraduates so the colleges were closed to visitors but that obviously hadn’t stopped them from other cultural activities. 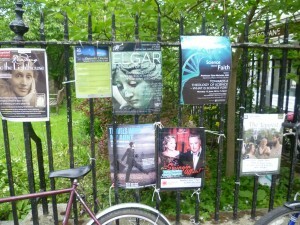 The railings were covered with flyers for various events, including: a reading of Virginia Woolf’s To the Lighthouse; a lecture ‘Science versus Faith – Towards a Theology of Science – What is Science For?’, Shakespeare’s The Tempest; and Elgar’s rarely performed The Dream of Gerontius. Varied, and definitely highbrow! Visiting Market Square is a must for us. There are fruit and vegetable stalls, of course, but also stalls selling hand-made jewellery, leather goods, dried fruits, books, ethnic clothes; plants – you name it, there’s a stall selling it. I was looking for a replacement for my useful but now shabby black leather handbag; Eleanor wanted to buy one of the ethnic shirts her husband liked. However, we were side-tracked by the smell of cumin and coriander from Madhur’s Tikkatonic stall selling his home-made curries, bhajis, samosas and raita. 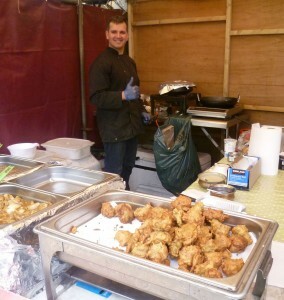 His base is in Bury St Edmunds and he brings his delicious home made food to Market Square every Monday and Friday. So we had lunch, sitting under his awning and watching the world go by: Eleanor had chick pea curry and rice; I had chicken tikka and a specially made for me egg naan. Scrumptious – and very filling. We needed a walk! 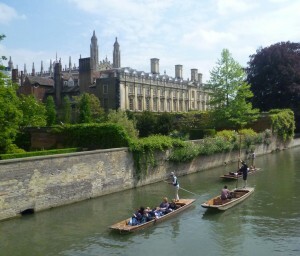 A small passage between Senate House and Gonville and Caius College wound down to a bridge over the River Cam to the Backs, and we paused on the bridge to admire the punters on the river Cam with Trinity Hall in the background. It was all very green and peaceful; the hawthorns were covered in creamy blossom and a magnificent horse chestnut tree, covered in white candles, stood proud. However, we still needed to find the black handbag and the ethnic shirt. 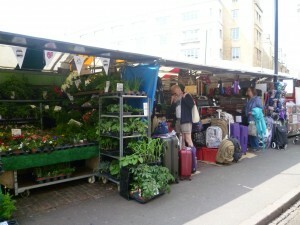 So we returned to the market, more purposefully this time, and successfully. Earlier, we’d passed Aromi’s Sicilian home-made ice-cream shop and somehow we found ourselves sitting on a bench in Peas Hill, licking ice-cream cornets. Even though I chose the smallest cornet, the amount of hazelnut ice-cream on top of it was enormous, and I was already full of curry. My note to self says: next time try Sicilian lemon – or, go easy on the curry. We’d been pavement pounding for about five hours; it was time – almost – to call it a day. We set off slowly back towards the station. 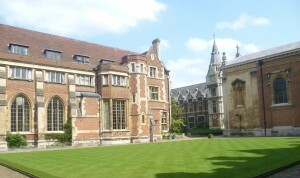 I paused briefly to photograph Pembroke College where my eldest brother had read history. I remembered going to his 21st birthday dinner in one of the college parlours; they brought out some of the magnificent college silver to celebrate the occasion and it glowed in the candlelight. We didn’t want to go home quite yet, but nor did we want to walk too much more. So we visited the wonderful forty-acre Botanic Garden, set up in 1846 by John Stevens Henslow, professor of Botany at the university (and mentor of Charles Darwin). 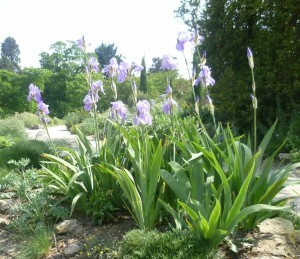 The spring planting was a restful purple-blue and white and the trees’ leaves were newly green. Purple alliums stood up like drumsticks. 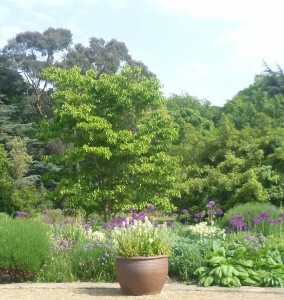 Naturally, the Botanic Garden has an excellent café, so we had a cup of tea and admired the plants for a while before strolling to the Station Road entrance, past a huge cedar of Lebanon, and back to the railway station. There was a train just about to go and we caught it. 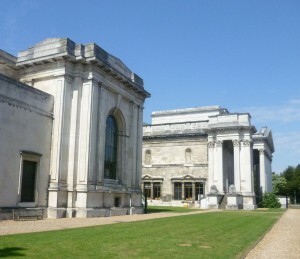 As I said, Cambridge is a city of infinite variety; we could have visited at least half a dozen other wonderful museums but, on this occasion, we didn’t. And it was a great day out.